Welcome back to the Deepdale Podcast, the place to listen ‘If you’re fond of sand dunes and salty air, Quaint little villages here and there’. We’re all about the beautiful North Norfolk Coast, and what’s happening here at Deepdale Backpackers & Camping and in the local area. This is our second edition, and its July now. The weather has been dry and sunny here for what seems like months. When was the last time we had so many beach days in one Summer? In this edition we’ve chatted with one of our lovely business associates, MarGins Walking & Glamping, and there are various other bits of news. We’ll have our usual overview of events locally, and a heads up of Deepdale Music events in the diary, including the Sunday Session at the end of July, the Open Air Shakespeare in early August, and of course the Deepdale Festival. The exciting news from late June, is that Mini Deepdale at the Royal Norfolk Show won the Best Tourism Stand Award. We teamed up with MarGins Walking & Glamping, Retro Campers Norfolk and the Norfolk Coast Partnership to create this little slice of Deepdale, and couldn’t quite believe it when a couple of bowler hatted gentlemen wandered over and handed us a rosette and certificate. Proof, as if you needed it, that cooperative working is the way to go. We get a cup, which we’ll proudly display in Deepdale Visitor Information Centre when its engraved. In other news, there are a bunch of new faces in the Deepdale Crew, so hopefully you’ll meet them when you come to stay next. The campsite laundry is up and running, so no need to worry about how many sets of underwear you brought with you during your stay. Our campsite has been certificated by ACSI, the European camping guide, which we are very pleased to be involved with. And the crew of Deepdale Backpackers & Camping and Deepdale Farm have been nominated for the British Farming Awards, in the Diversifcation category, so fingers crossed that the judges like what we are doing. We are very excited to say that Das Fenster and the Alibis are joining at this year’s Deepdale Festival. These guys played at Deepdale on 1st July and were brilliant, so good that Chris immediately booked them for the festival. They describe themselves as voodoo rock, but what ever description they give themselves they will make you want to dance. At the time of recording there is just a six bed dorm and two female dorm beds available for the weekend. All the rest of the accommodation is full. However, don’t worry if you’ve missed out on staying with us, you can still enjoy the great music with a Day Ticket and book yourself in somewhere locally. Why not have a look at the accommodation list on burnhamdeepdale.co.uk that includes lots of local hotels, bed & breakfasts and the like. 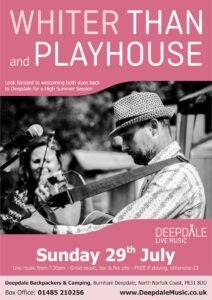 On Sunday 29th July, we are looking forward to welcoming Whiter Than and Playhouse back to Deepdale for a joint Sunday Session. Whiter Than happened to be staying with us last year and mentioned they could hold a tune. It turns out they can do a lot than just hold a tune, and as they are coming to stay again this Summer we invited them to play again. They are joined by Playhouse, who Jason discovered busking in Norwich, and have since featured on BBC Introducing and played at various Deepdale events. Should be a great evening, and its free if you are staying, and just £3 per person if you aren’t. We’ll have a bar, so bring snacks and enjoyed this chilled evening. As we move into the school holidays there seems to be a huge increase in the number of events taking place here on the North Norfolk Coast. All the events mentioned here are listed on our website deepdalebackpackers.co.uk/events where you can find lots more information. The National Trust, RSPB, Norfolk Wildlife Trust, and Holkham National Nature Reserve all run events at their various locations along the coast, including Sea Dipping, Tree Appreciation and Beach Combing amongst many other nature related events. These are great family events and really immerse you in the local environment. Beach Cleans take place throughout the Summer, continuing the hard work of removing some of the unwanted plastics from our beautiful coastline and sending it for proper recycling. We are awaiting the dates of some of the local gatherings. Please get involved wherever you see these events, as they really are a great help towards keeping the environment of the North Norfolk Coast at its best. There are some wonderful art exhibitions on at the moment, including Cley18 which is not surprisingly is taking place in Cley, and the Gallery Plus Summer Exhibition in Wells-next-the-Sea. The King’s Lynn Festival runs until the end of July and has some great events in various venues around King’s Lynn. If you don’t know King’s Lynn, you’ll be surprised by the rich history of this port town and some of the great venues for events during the festival. The Pop Up Shops continue at Dalegate Market, changing each week on a Wednesday, so if you are around for a week or more you are likely to see many different artisans and producers. Creake Abbey have their cinema weekend from 20th to 22nd July. And the Cley Summer Fair takes place on Saturday 21st July. A fantastic event is the Cromer Lifeboat Day on Sunday 22nd July, when the whole town goes Lifeboat crazy. You can watch launches of the main lifeboat, see exercises at sea and enjoy the atmosphere on the beaches and pier. The Pizza Nights with the Wood Fired Food Co on Wednesday and Fridays, and Curry Nights with Currylicious on Saturdays continue at Deepdale Backpackers & Camping. 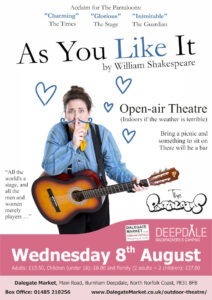 Tis the season for open air theatre with various plays at Holkham in the courtyard over the next month and open air Shakespeare here at Deepdale on Wednesday 8th August. Deepdale Café offers Summer evening street food on Friday and Saturday nights throughout the Summer holidays. If you fancy a visit to Norwich then don’t forget that the GoGoHares trail is on until early September. There are 50 giant hares around the City and more in various locations around the County. They are wonderfully decorated by very talented artists, and we are very proud to be the sponsors of BoudiccHare, who is sitting on the street near Norwich Cathedral. You can easily spend a day hare spotting around our wonderful cultural County City. In early August there is the Brancaster Day & Fun Dog Show, which is a very enjoyable celebration with everything from fair ground rides to tug-o-war. None of that may take your fancy and you may just decide to find a quiet spot and enjoy the huge skies and calmness of this beautiful part of the world. If you need more information on any of these events please have a look at our website deepdalebackpackers.co.uk/events or pop into Deepdale Visitor Information Centre and have a chat with the lovely Deepdale Crew who are more than happy to help. Remember we are open all year round, so you can enjoy the changing seasons of the beautiful North Norfolk Coast with us at any point. Thanks for listening, and we look forward to seeing you soon.